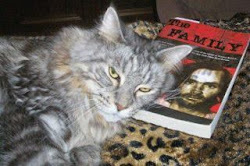 The Tate-LaBianca Homicide Research Blog: Another Cool TLB Book, Discovered by "The Grump"! Another Cool TLB Book, Discovered by "The Grump"! It includes Leslie’s 46 page short story titled “Ima Fibben” and 40 pages of poetry written by Pat. First, “Ima Fibben” is good! Very well written, and when it ended I wished it would have continued on to a novel! A young girl, “Ima Fibben” tells about being in jail for the first time, and the story of her adjusting to prison life. It begins with her being called a “new fish” (shades of Shawshank Redemption), to the end where she get’s a “new fish” cellmate and begins to teach her the ropes as others taught her. Pat’s “poetry” is very good as well. I know there is a word for this, but it doesn’t rhyme at all! She never mentions Charlie by name, but as you can see by these two poems, she was obviously talking, and thinking about him. She was still so in love with him in 1976! Rested listening to your beard grow…. Making full circle around you. To a single dark perspective he pops a pimple on your face. And you continually ask for another card. He always comes out a winner. Like a Mississippi riverboat gambler. Though there is no wind. Though he usually wears shoes. And make it an acre. Up to be worn as a taste of life. The music continues to change. For someone else to incorporate. Can make a show that will stun. And you know you have. If he even enjoyed you. $50 on a 1 lb. bag of sugar\nor a complaint about wanting salt. And he will push harder. Uses to his own advantage. Buys a candy bar instead. Which cause you to think. I like Pat's writing, as well. I added your name to the "Thread Hall of Fame". I apologize for forgetting (to add you on), the last time. It was an honest oversight. Thanks Grump. I'd like to read Leslie's story. Sounds interesting. Ima Fibbon used to be on Bretts site as well and I remember feeling the same way after reading it- it should have went on longer. Lulu still had a pretty sharp sense of humor when she came up with this. It was witty as hell. Hey St! Live long and prosper my friend! I read LuLu's story years ago. In it she mentions being told upon her arrival at the clink that she will not be released until she is in her 70s. When a dying Sadie was denied her compassionant release bid and then died in prison It must have been a a day of final reconning for LuLu. The day Sadie died was the day LuLu realized she would never be released. The hopes of Ima Fibbon were forever dashed when Sadie died. LuLu now lives a life without hope. I'll hate to see Brian's Star City show go on hiatus. I do too Mr. P. I really look forward to his show. Everybody needs to take a break from this stuff, once in a while. If you don't take a vacation every now and then... you'll go bonkers. A little time away, is a healthy and responsible decision. Thanx for the post. Personally, I don't search out Manson books, too much info online. I would like to read "The Long Prison Journey of Leslie Van Houten", I found a few chapters of it online, but I think it's since been removed. I also found a list of books related to Manson, I think there were like 100 or 150 books, I can't find that again either. While looking, I ran across what I guess is a somewhat new pic of Manson, Star, and a person I don't recognize, that pic is on Manson Direct HERE. Manson's 2 black eyes are visible and appear to be healing somewhat. 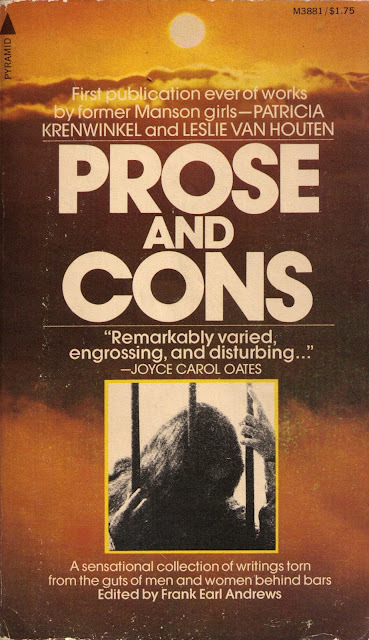 The books on Manson are many times just good reading. They are page turners. There are several movies that are good as well. I have my own ideas for a movie starring Simon Pegg entitled "Manson's Zombie Women From Death Valley". Lrnyrd has a major role in the movie. He plays Archie Bunker who meets the "Girls" in Death Valley while repairing a flat tire near Ballarat while on vacation. Sunset, it looks like Charlie and Star are making some kind of symbol with their hands. Do you know what that means? I also found a list of books related to Manson, I think there were like 100 or 150 books, I can't find that again either. I know exactly which list your referring to, Sunset. It is a great source. Thanx DebS, you are correct, the Anglefire list you posted a link to is exactly the list I had seen. Katie, I noticed the hand symbols Star and Manson were making in the pic also, no I don't know what they mean if anything. They often make strange, or interesting gestures in photos, they might know the meaning of them, but I don't. I suspect the reason many people write books is the same reason many people make movies, money. Many movies are simply "exploitation", they exploit the murders, the victims, the perpetrators, the court case etc. appealing to prurient interest to make money. As Archie Bunker would say, not exactly a "high class" business. Thanks for the list Deb! I had no idea White Rabbitt wrote a book! I'll look into it. Thanks Grump , Interesting post ! Hi St. Really enjoying the gifts and have not wore them out yet. Greatly apprieciated. Thanks again ! by the way< that Cindy L makes very good points. Ive read it. It's mostly bs. I think he may have met some of the Family and maybe been at Spahns but who knows. Maybe even White Rabbit doesn't know either. He's a strange man with an addled brain and a desire for attention. For those who haven't read this already. I ran across a pic on the "ATWAR" blog of Lynette Fromme pointing a pistol that I wasn't familiar with. That pic can be seen HERE. Just in front of the rear sight is what appears to be a tiny button that is probably the "slide lock". My dad had 2 pistols that were very similar although I think the barrels on my dads pistols might have been an inch or 2 shorter. They were both semi automatic .22 caliber, one was a Colt "Huntsman", the other, a Colt "Woodsman". They both had that tiny button slide lock. If you pulled the slide back, pushed the button down, and let the slide forward slightly, the action would stay open. It came in handy if the gun "jammed". I remember more than once using a screwdriver, pen knife, ice pick, dime, etc. trying to remove a stuck shell or casing. A pic of a Colt Huntsman can be seen HERE. Not a Colt. Most likely a Ruger. Look at the grip used to pull the slide. It is verticle. A Colt has a 45 deg slant. I believe that is a picture of fromme from 1973-1974 in the bay area. she and friends used to go to a gun range about 20 miles from where I was living at the time. I thought this was interesting. It is a study saying paranoia is the key ingredient to mass and serial killers. Though not included in the study I think Manson was extremely paranoid as well. I also remember reading in Susan Atkins books that the three did alot of embroidery in prison and some of it was published/written about in some magazines anyone know about this? 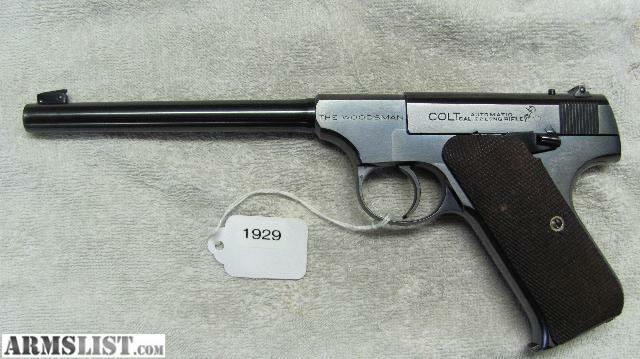 Pic of a Colt Woodsman with a vertical notched slide grip and button slide lock HERE. Nah. That is still slanted. It cant be a Colt at all. Mr. P., I don't know much about guns, but that picture that Sunset produced says "Colt" right on the gun. LOL. both pics, the huntsman & woodsman clearly say colt on the gun. what are we missing mr. P ? I'm saying that the pistol Squeaky is shooting in the pic Sunset posted is not a Colt but a Ruger. Hey the prose & cons of hitch hiking. Anyone see Clapton & the guy from Pinkfloyd ( name escapes me) on that concert tour ? I saw it in Toronta about 82 or 83 i guess. Sorry Mr. P. I was misconfused about which picture you were talking about. LOL. Bobby said: Hey the prose & cons of hitch hiking. Anyone see Clapton & the guy from Pinkfloyd ( name escapes me) on that concert tour ? I saw it in Toronta about 82 or 83 i guess. Katie, If you Blinked You missed it, lol. and Grump, I didnt toss that out to hi jack your cool post. It just popped into my mind. bobby said...Hey the prose & cons of hitch hiking. Anyone see Clapton & the guy from Pinkfloyd ( name escapes me) on that concert tour ? I saw it in Toronta about 82 or 83 i guess. Thats weird you should mention that,i just posted my ticket stub for the show i was at from that tour on facebook. I'm pretty sure it was the first u.s. show of the pros and cons tour. a 16 dollar ticket to see roger waters and eric clapton....don't think we'll ever see prices like that again! Sunset if you blow up that pic to 850% you can see that that pin(slide lock) you speak of is actually the front of the ejection port. Interesting she calls him a doe. I don't think it's good poetry at all, but it does capture him pretty well as a kind of prose poem. This is about Anne Boleyn, by Thomas Wyatt. Wyatt loved her before Henry (Caesar) came along, but since he was married, couldn't have her and yet couldn't leave off chasing her. Same imagery of a doe "wild for to hold, though I seem tame" Could there be a better line than that. Love this poem. Anne was not beautiful at all, but she had a quality, elusive, compelling and mysterious, she scared people and enchanted them: Henry came to believe she had caught him with witchcraft. Maybe Charlie is her reincarnation.